It is a challenge to cook for Sarah and Evan. They are always gracious and polite, but you worry that whatever you cook might not be up to their standards. During their recent visit, they stayed in a resort hotel near the Plaza for a couple of nights. Their reports on meals were, “Oh, they were OK.” Hardly a resounding testimonial. In the meantime, Susan and I took care of the 2-year old and the 4-year old. We had a lot of Cheerios, hamburgers, Kraft macaroni and cheese dinner, and hot dogs. That seemed to work as long as Susan could buy them off with ice cream on a stick from the Village Market. Still, I accepted the challenge to cook outdoors on Independence Day. I decided to have “Spanish Night” actually Spanish/Mexican Night. We started with Sarah’s well-known watermelon margaritas along with olives, manchego, membrillo, and crackers. We were also going to have marcona almonds fried in olive oil and Spanish paprika, but I forgot them. Then gazpacho – not the mushed up kind, which I don’t like, but instead coarsely chopped vegetables in a double consommé. Evan told the four-year-old that it was a kind of special tomato soup, and he got very excited. He said he loves tomato soup. He was disappointed when it came out and refused to eat. Fortunately, we had a can of Campbell’s tomato soup, the kind that his best friend’s mother serves. We heated that up, and a dietary crisis was averted. Then came the main course. 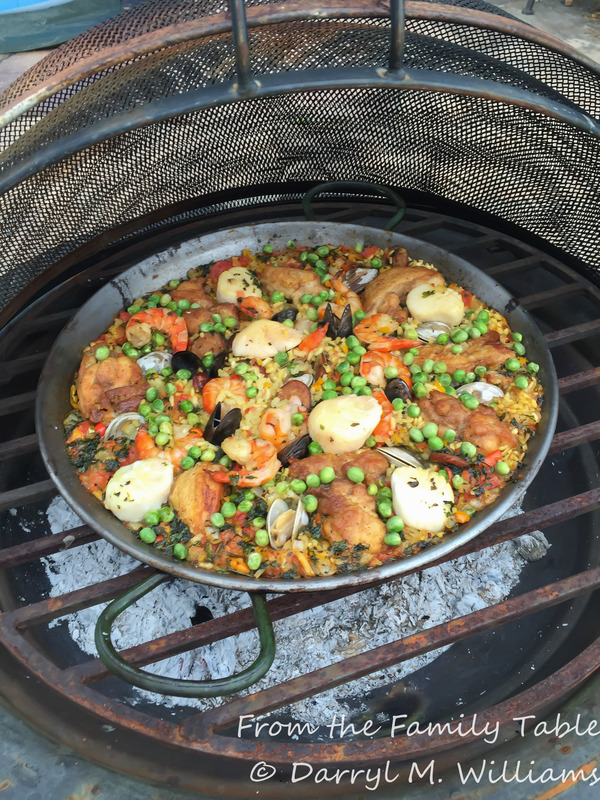 I cooked paella over an open fire in our outdoor fire pit. 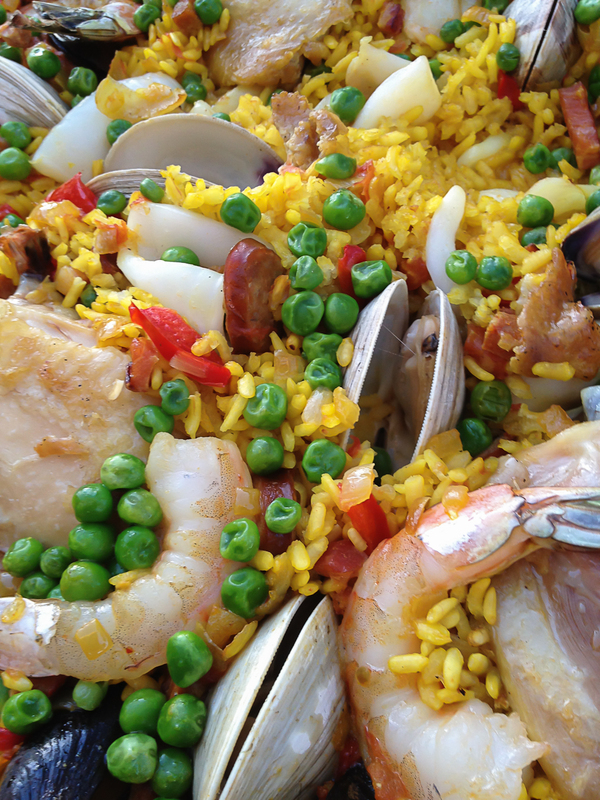 The dish had chicken, shrimp, scallops, clams, mussels, and chorizo. Again, I forgot something – this time it was the calamari. 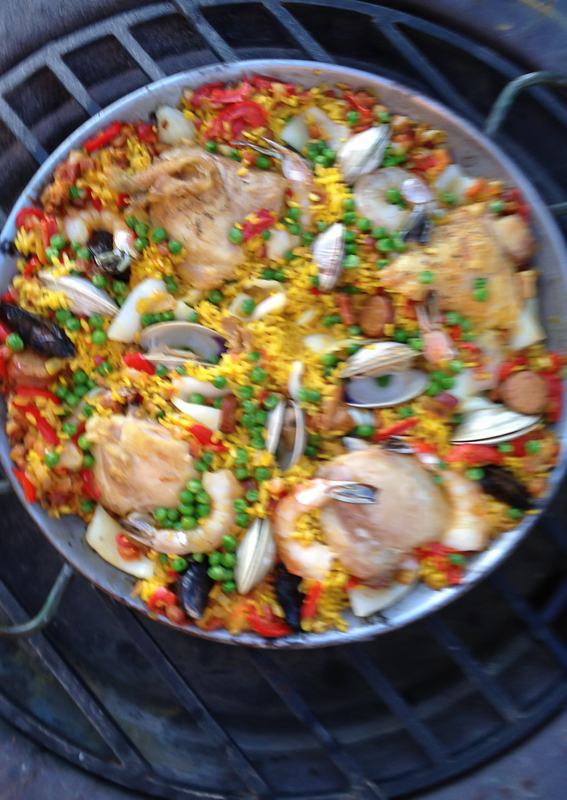 Nonetheless, the paella cooked well over the open fire and wound up with a good crust. Not surprisingly, the four-year-old would have none of it. He did eat the home-made churros and cajeta. Then we watched the fireworks displays from several locations all around us. Of course, the conversation turned to family times in the past, and favorite foods while growing up. Sarah said that one of her favorites was Susan’s soft-boiled eggs for breakfast, served in egg cups. The four-year-old was very excited. That inspired Susan to get up early, select egg cups from her big collection of family treasures and antiques. Then she made soft-boiled eggs, served them in special egg cups, and topped them with hand-knitted egg cozies. The four-year-old would have none of it. Fortunately, we had some Campbell’s tomato soup left over from the night before. All of this proves that it’s harder to cook for a four-year-old than a professional chef. It is also hard to get decent photos with a four-year-old. Ah well, we all still had a good time.